For this Link credit goes to Peter Page from the fantastic Yahoo group “TO&E”, which is to my knowledge the best place in the internet to search and inquire sources and information about the organisation, structure and the equipment of any modern army (“modern” being used here in the classic sense of “after the medival ages”). The TO/E group not only shares news and updates about armies around the world, but also is able to point you towards archival records and rare books available only in selected libraries. 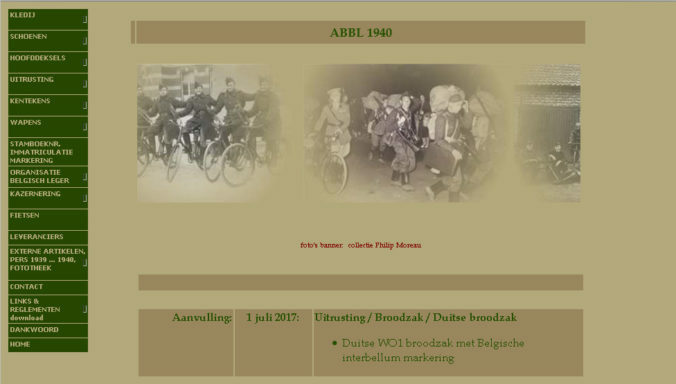 In this case, someone pointed out a small treasure trove of digitalized documents, regulations and TO/E information mostily about the Belgian Army between the wars and up to 1940. The website is heavy on equipment and weapons and their history, but together with a small but carefully selected collection of images the authors manage to create a solid picture of the state of the Belgian Army up to the Second World War. Google Translate is only marginally helpful, since the website seems rather old and still uses frames, but the content makes it well worth a visit!